The UFC100-L2 (Unified Fieldbus Controller) is a peripheral that can be used in a Fieldbus Device or Host to provide a complete solution for implementing Fieldbus equipment. The UFC100-L2 includes all of time-critical functions in the hardware including address recognition, filtering of received frames, Timer management and Data Link State machine. It implements part of Physical and Data Link Layers for the Foundation Fieldbus H1 and Profibus-PA. The state-of-the-art production process guarantees a longtime availability. UFC100-L2 replaces UFC100-L1. The 5 V tolerant inputs of L1 have been changed to 0-VDD inputs. Otherwise, both are identical. Fieldbus ASIC for FOUNDATION fieldbus and PROFIBUS PA.The UFC100-L2 is suitable for field devices and controllers. 128 byte FIFO can store one frame of most types. Filters the received frames and automatically rejects unwanted frames. For most frames, only one interrupt per frame is generated. Rejected frames do not generate interrupt. Timer control is in the chip. Token Timer is automatically loaded from the received Token. 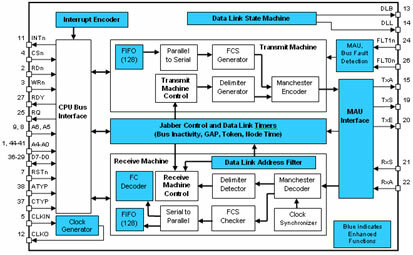 Many of the state machine transitions are done in hardware. Copyright 2012 © Aniotek Inc. All rights reserved.